"Help Wanted," Say DC Plan Participants--Will They Seek It? According to Spectrem Group’s DC Participant Insight Series report, Financial Behaviors and the Investor’s Mindset, just over one half (54 percent) of DC plan participants consider themselves to be self-directed investors, meaning they take sole responsibility for their financial and investing decisions. The remainder of plan participants engage with advisors on some level ranging from guidance for specific life events to total dependency. And yet, 61 percent of all plan participants indicate that being able to retire when they want to is their primary personal concern. This is almost equal to their concern about maintaining their current financial position (63 percent) and worries about issues related to health and aging. A further mixed message is that only 39 percent express concern about getting adequate help and advice to allow them to reach their financial goals. Concerns about obtaining adequate help and advice are heightened among certain demographics of plan participants. Across all generations, Millennials comprise the largest percentage (47 percent) of those who express this concern, followed by Gen Xers (38 percent), Baby Boomers (36 percent) and World War II generation participants (21 percent). Not surprisingly, women plan participants are much more likely than their male counterparts to worry about getting adequate help and advice that will allow them to reach their financial goals. They are also more likely than men to indicate concern about maintaining their current financial position and the financial situation of their children or grandchildren. 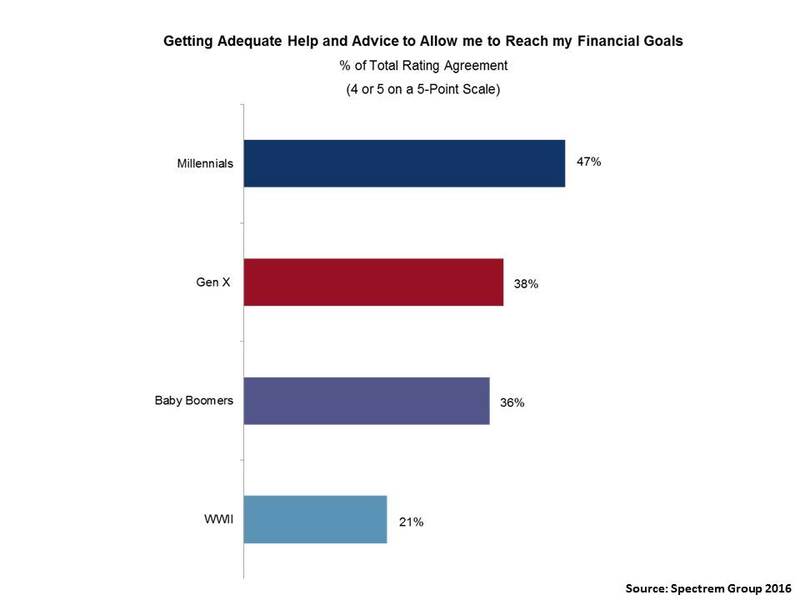 Also not surprisingly, participants with lower plan balances are more likely to indicate concern about getting adequate financial help and advice to reach their goals. Half of those with plan balances between $10,000-$49,999 and between $50,000-$99,999 express this concern, compared with just 27 percent of those with a plan balance of at least $750,000. · Providers and advisors need to apprise plan participants of the retirement planning materials available to them.More employers are taking the lead in offering retirement planning advice through their retirement plans. But employees, especially those who are just beginning their jobs, might not be aware this supplemental material is available. · It’s never too early. Millennial employees living in the moment of meeting daily expenses or paying off student loans may not have the mindset of saving for an event that is decades away. Providers and advisors need to impress upon them the benefits of contributing to a retirement plan even at the lowest level. · Information, please. Whether it be hard copy articles or articles and blogs posted on your website, create accessible, user-friendly information on retirement planning topics that will get participants more engaged with the process. · Self-Directed investors who make their own financial and investment decisions may be open to advice, but reluctant to ask for it. The information you provide plan participants could be the impetus for opening lines of communication with them.